I think this is a well written article that describes the fear of electrical storms that I have. There are some powerful statement that Emma’s father makes it here, and although I am not quite to the level of sailing zen he seems to embody, I believe I’ll get there eventually. The foulness of the weather on Scotland’s west coast is legendary. At 56 to 58 degrees north latitude, the region is directly downwind of the Icelandic low pressure zone, the Northern Hemisphere’s principal weather maker. In August of 2013, at what was supposed to be the height of the summer, we had three gales in two weeks, a force 8, a 9 and a 10. In May of that same year we had rain pretty much every day, both outside and inside the boat. (The porthole and hatch rims all dripped with condensation, and mildew was an ever-present problem.) A succession of hailstorms left our decks covered in ice. We got lucky in June with two weeks of settled weather in which to explore the Outer Hebrides, but then paid for it with what the Met Office called “an unusually vigorous low.” In the first half of July, while the rest of the UK basked in a heat wave, we rarely saw the sun. Terrie, my wife, and I now have the luxury of being free to cruise pretty much anywhere we choose and of having the perfect boat with which to do it. But there we were in Scotland, somewhat bemused by the fact we were planning to lay up our boat on the River Clyde for the winter so that we could return next year. The Scottish isles have sunk their teeth deep into us and so far refuse to let go. What is it that is drawing us back? The answer is the incredible rugged natural beauty of the place. It’s the spectacular wild landscapes, with islands on every side and not a house to be seen. It’s the play of light and shadow on the towering cliffs and mountains as shafts of sunlight pierce the clouds and rain showers, sweeping across the countryside like a giant searchlight. It’s being in both sunlight and rain at the same time with a glorious double rainbow stretching across the horizon. It’s having the clouds and mist lift for a few minutes, an hour or two, and sometimes a day or more, to reveal majestic 3,000-foot peaks all around, dusted with snow in the early summer. It’s the fleeting and astonishingly beautiful sunsets on those evenings when the sun drops free of the clouds minutes before sinking over the horizon. Look a little closer and you will also find a fascinating record of human habitation stretching back as much as 8,000 years, but abruptly terminated in the “clearances” of the 18th and 19th centuries, when the highlanders were forced off the land to make way for sheep. The prehistoric standing stones at Callinish are second only to Stonehenge. An impressive double-walled 2,000-year-old defensive “broch” on the Isle of Lewis in the Outer Hebrides testifies to a long history of strife. The Vikings rampaged and settled here. The region is littered with ruined castles, the occasional one magnificently restored, and none more impressive than Eilean Donan. For thousands of years right up to the clearances, the common people lived in rock-walled hovels with heather-thatched roofs, a peat fire in the center and a hole in the roof to vent the smoke. The remains of these primitive dwellings, “black houses,” are everywhere. Then there is St. Kilda, 50 miles out in the inhospitable Atlantic, with no all-weather anchorage and a near perpetual swell, inhabited by a primitive peasant community until the 1930s, the Holy Grail of Hebrides cruising. We were lucky enough to get the spell of settled weather and flat seas necessary to visit, albeit at the cost of having to motor there and back. The low clouds lifted halfway up the mountains as we anchored, with the sun breaking through and lighting up the ruined village long enough to dash ashore and capture the magical scene before us. By the following morning a fog had closed us in. Traditional Highland games are a serious business in this part of the world! The sea life throughout the western isles is phenomenal. As the tide recedes clusters of seals wiggle their way onto the rocks. On a beach on Mingulay in the Outer Hebrides—another exposed anchorage that can only be contemplated in settled weather—we watched upwards of 40 young ones surfing onto the beach and then swimming back out to do it over and over again. Later that evening we were escorted by a school of dolphins up the channel into Castlebay on the island of Barra, where we went to find a sheltered anchorage for the night. On any passage of more than a few miles porpoises are likely to be seen. Giant basking sharks occasionally ripple the surface. We have drifted on a placid sea between the “Small Islands” of Eigg and Rum (there is nothing small about the deer-stalking mountains on Rum) while a pod of Minke whales fed on schools of mackerel around us. When the mackerel are running the fishing is extraordinary—we have cast a string of six hooks over the side and immediately pulled in six fish. In many anchorages there are mussels for the taking at every low tide. The tides and tidal currents are impressive. Terrie mutinied when I proposed sailing through the Gulf of Corryvreckan. Unfortunately, she had done her homework and read about the 10-knot currents, whirlpools and 10- to 15-foot standing waves. This is nature at its most elemental. We have several times run through Kyle Rhea in the Sound of Sleat with 5-knot currents driving us forward. A set of tide and current tables and knowledge of how to use them is essential. Allowing for the 10- to 14-foot rise and fall is a critical aspect of anchoring, and there is no substitute for first-class ground tackle. Our principal anchor is a 73lb Rocna (or Manson) with an all-chain rode. Other than my misjudging where to drop it, we have only had to reset it a handful of times, such as when we picked up an abandoned lobster pot, and when I set it too aggressively in heavy kelp, ripping out a clump by the roots, which then prevented the anchor from digging in. We have found it to be a phenomenal anchor in everything from soft mud to rock (far better than the CQR, Delta, Bruce and Danforth-style anchors we have used in the past; I suspect the Spade and Ultra anchors have similar properties to the Rocna and Manson). It is the plethora of all-weather anchorages scattered strategically throughout the region that makes cruising a practical reality. No matter where you are, other than at St. Kilda and on some stretches of the western shores of the Outer Hebrides, there is an anchorage within a few hours sail with sufficient protection to ride out the worst gale. However, negotiating the entries to many of these requires a fair bit of rock dodging (notably Loch Moidart, with its romantically ruined castle and great beach, and Arisaig). One will greatly benefit from good charts and a knowledge of how to use them. We have been running Nobeltec electronic charts on the laptop and Navionics on the chart plotter (and iPad) and have found both to be remarkably accurate, even when grossly overzoomed. Beyond where the charts have run out of detail, we have crept into many anchorages with a bow lookout watching for rocks and only bumped once (attempting to pass between the slate islands of Seil and Easedale). We have recently been told the Antares charts (antarescharts.co.uk) provide highly accurate details for many popular anchorages. Terrie does not like this rock dodging; it is the bird life that draws her. Circling the Isle of Mull we saw both white-tailed and golden eagles. In the Shiant Islands we drifted in the dinghy into a mat of razorbills and guillemots, watching the birds swim under us in the crystal clear water. Ashore were a quarter million nesting razorbills, guillemots and puffins. We thought it could not get any better than this until we went to Boreray off of St. Kilda, where we circled close inshore, gazing up at a million birds: including tens of thousands of magnificent gannets, perched on ledges on the face of massive vertical cliffs that disappeared into the mist and low clouds above us, with a constant cacophony and the ever present smell of guano adding a dimension that no photograph can capture. Even this could not top the thrill of being able to wander close to nesting puffins on the Treshnish Islands, with the birds clumsily flying on and off the cliff tops and hopping into their burrows, unconcerned at the human presence a few feet away. The only protection of any sort close to Boreray is the open roadstead at St. Kilda. The Shiants and Treshnish have exposed anchorages subject to ocean swells. But at least for the Shiants you can beat an overnight retreat to Scalpay and for the Treshnish to the South Harbour on Gometra, both just a few miles away. We found Scalpay to be testimony to the strength of Protestantism in these parts: the local store does not sell Sunday newspapers and the children are not allowed to use the playground on this day! Between the Treshnish Islands and Mull lies Staffa. It is the epitome of the dramatic geology of the region, with hexagonal basalt columns topped by a thick icing of lava and pierced by Fingal’s Cave (the inspiration for Mendelssohn’s “Hebrides” overture). The mountains of Mull and Skye have been thrown up by massive volcanic eruptions and carved by ice a mile thick. In contrast, there are the low islands such as Benbecula in the Outer Hebrides with miles of sandy beaches on the western shores and not a footprint or person to be seen. We have sailed in many parts of the world and have not seen landscapes to rival these. Even the weather has its good side. The corollary to the frequent low pressure systems and gales is that there is generally plenty of wind for sailing, and over the course of a week the wind is likely to box most points of the compass. So long as you are flexible as to your destination, and so long as you have the time to sit out the gales in some protected anchorage, it is generally possible to sail with a favorable wind to somewhere delightful. I typically do not make a firm decision on where to go on any given day until the night before or the morning in question. Sometimes we change destinations in mid stream. As a result, we have had numerous fast and exciting passages and have rarely had to beat to windward in anything particularly unpleasant. On the backside of our current gale, I expect a fast reach to our next port of call. For me, this has been some of the most enjoyable sailing we have ever done. I have come to the conclusion that the fundamental keys to cruising in this part of the world are first, to give yourself sufficient time to be able to sit out the nasty stuff, and second, to avoid sailing to any kind of a schedule (so you are not driven to undertake unpleasant passages). And so it is we find ourselves looking forward to another season in this often miserable climate. After that, it is definitely south to sunnier climes. Navigation at sea used to be dominated by the question ‘where are we’ and sailors from Polynesians in canoes to Columbus looked to the sun and the stars for help. But when navigating by star charts and sextant, one could only establish their position once or twice a day in ideal circumstances. In cloudy or inclement weather, the navigator was reduced to “naviguessing”! Now, our location is given to us by highly accurate GPS several times per second, so the question has changed from ‘where are we’ to ‘where do we need to be in 6 hours or tomorrow in order to go fast’. We judge time and distance all the time in our everyday lives using our sight and experience of how the world works. In running to catch the bus, we wouldn’t step out to cross the road in front of a speeding Ferrari. But if the next vehicle is a VW camper van with flowers on the sides and Bob Marley wafting from the windows, we know that we’d have time to get across. At sea this is harder, because we can’t see over the horizon to see if the next weather system is a camper van or a sports car, and our ability to cross the road is defined by the wind direction and strength we have now. In order to catch the bus, in this case a favourable wind, we need help to know more about the coming weather system and also how to define our potential performance of the yacht. The first part is taken care of by various models of weather forecasts that we download in a format called GRIBS, in which we can choose the zone we are interested in and the relevant time. Since racing yachts very in speed for a given wind strength and point of sail, our computer then has an algorithm in the routing software that looks at the wind we have now and tells us that we can, for example, go 10 knots upwind, 15 knots reaching or 12 knots downwind. So if you put those two elements together – weather conditions and boat performance – in the routing we can have a pretty good idea of where we can be in any future time given the forecasted wind. Because the boat goes faster on certain points of sail than others, going from A to B is not as simple as a straight line. For example, when there is a light air bubble of high pressure ahead, it could be faster to sail extra distance around it then to sail the shortest distance through it. 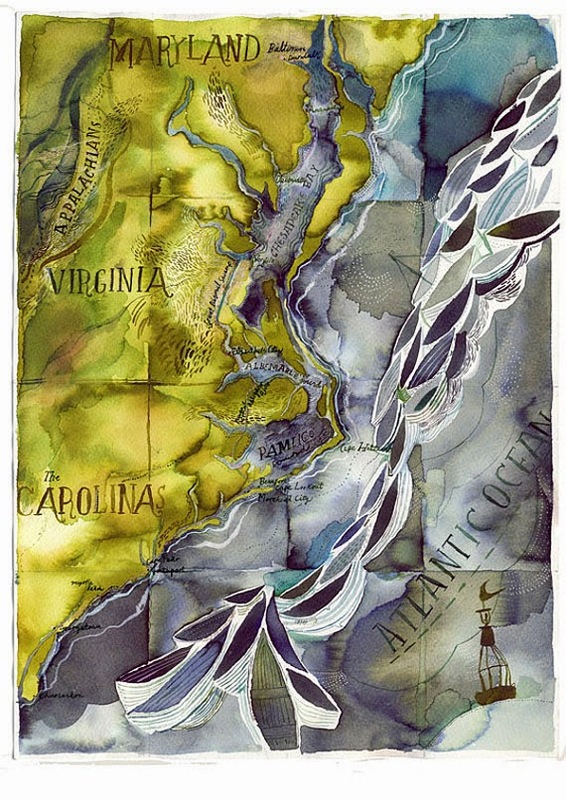 Modern navigation tools provides answers the sextent and paper charts could only dream of. 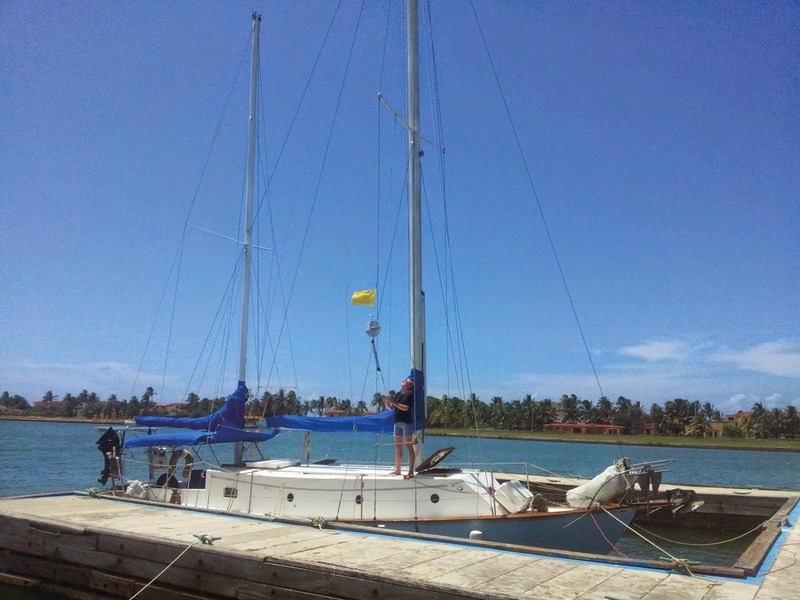 Hello faithful reader, this particular boat and its owners are an integral part to our sailing stories. 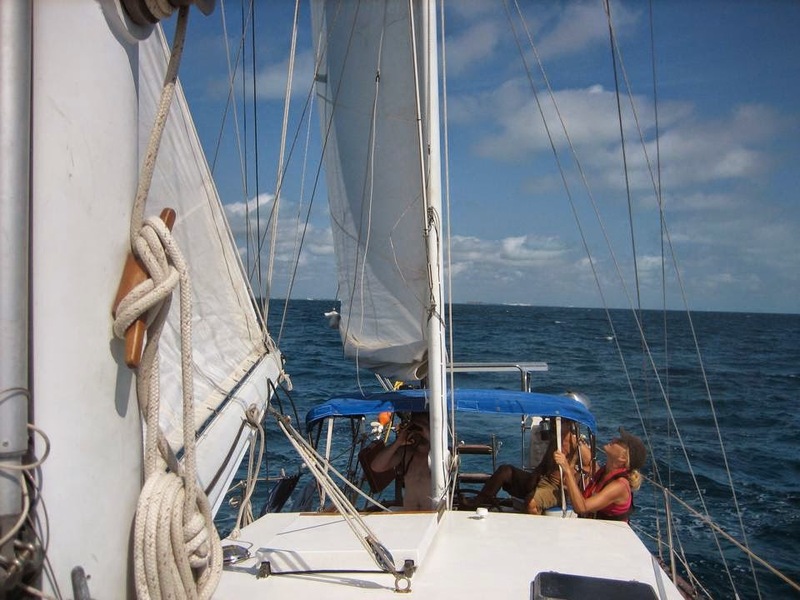 We met Rupert and Dory back in 2009 as we were sailing down the east coast of the USA in S/V Third Aye. Good times. This is a fantastic boat and I’ll tell you why. There are two reasons I recommend buying this boat; the structural safety of a ferro-cement hull and my full confidence in the craftmanship of it’s rebuilder, Rupert. This is a true cruiser’s kind of boat, and a well-cared-for one at that. Sandpiper, British-flagged yacht, one of the last ocean-going boats to be built in Baltimore, MD, by NASA engineer John Laudadio. She is a customised copy of Ocean Racer Finisterre and has taken us through the Carolinas, Florida, Bahamas, Cuba and the Caribbean. 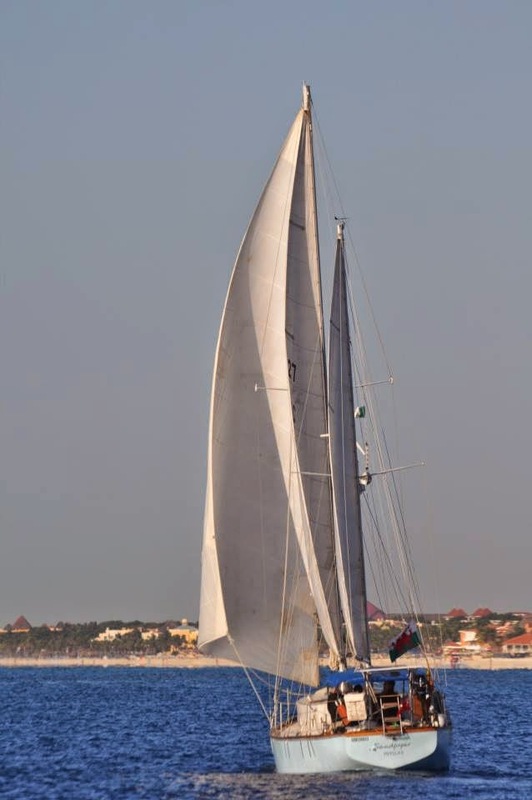 35 ft(38 ft overall) Keel-Centreboard rock-solid Cruising Ketch. Perfect for Bahamas and other shoal-draft areas, but with a world-cruising capabilities, this pedigree Ferro Cement classic has been immaculately restored and refitted. She is very much a hands on traditional sailing boat with hank on sails and a classic manual bronze gipsy windlass and barlow winches. Fast, comfortable, beautiful and unique. Built over-strong by NASA engineer John Laudadio, this is one of the last five boats produced in Baltimore in the 1970s and as such is allowed to parade in the Baltimore yearly historic regatta. An all-round Chesapeake classic – traditional Skipjack above deck, on a racer-cruiser hull (Finisterre:http://sparkmanstephens.blogspot.co.uk/2011/03/design-1054-finisterre.html). Teak lined with huge headroom. 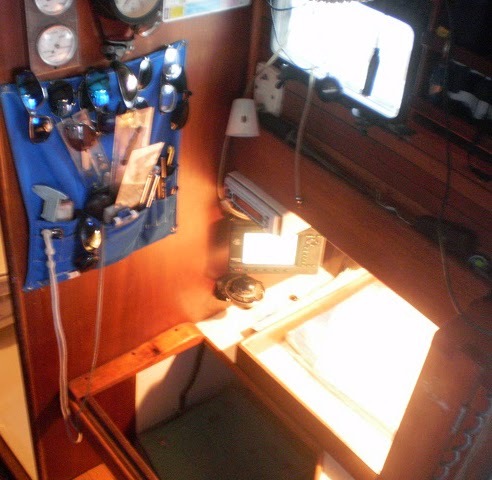 Radar, Wind, Solar, SSB, Garmin Plotter, Refrigeration etc etc. All fully functional and newly overhauled. Recent installation of long-range Yanmar 35hp engine on custom-built steel engine-bed, with only 1500 hours and a new transmission, this boat was known and loved for 30 years all around North Chesapeake. We have upgraded the systems for blue-water cruising (including re-wire, hot water etc.) over eight loving years. She was kept in fresh water and launched and raced/cruised seasonally until two years ago. 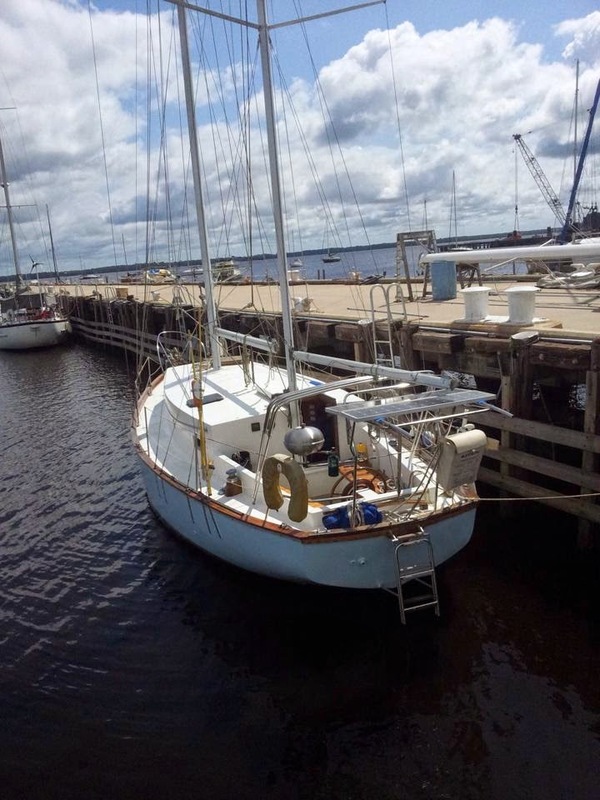 We have found her to be ideally suited as a cruiser live-aboard vessel, with her roomy and airy living quarters and a 4ft shoal draft with a drop keep centre-board which makes total draft 8ft 9” when down. Many photos and cruising blog at www.rupertallan.com and on facebook atVoyages of the ketch Sandpiper. This is a communal website for all those who know or are associated with the Yacht Sandpiper, her crew, her history, and her itinerant ports of call. Any and all questions welcome, as we know every technical aspect of the boat in finest detail! Full set of sails with 120% Genny, brand-new storm jib, spinaker and spare mizzen – all in very good shape with a couple of minor strengthening repairs made on the main clew by Irish sail lady in St Augustine. Two fold-up Dahon bikes for shore side wanderings. Check out our youtube video for a tour! Teak lined throughout, with Perko bronze portholes and insect screening. 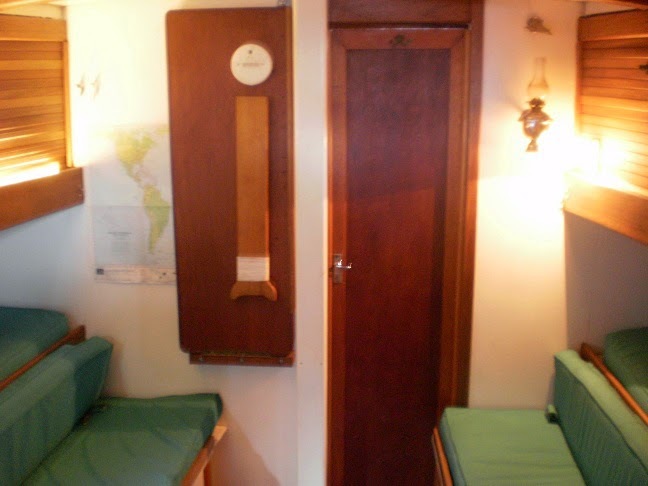 Ample storage under cushions in Saloon also in bilge and deck lockers. V-berth, Saloon, Galley, Head and Navigation area. Boat has 5 berths in total (double in V-berth, two pullman berths in saloon and one storm berth in navigation area.) All cushions recently reupholstered in teal Sunbrella by a professional seamstress. 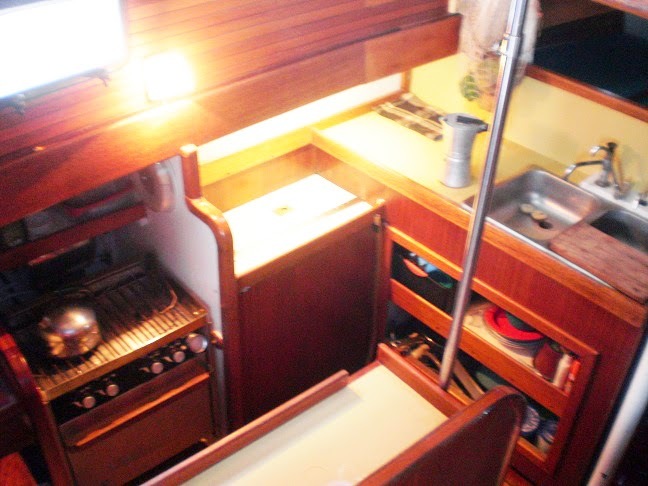 Force 10 stove in galley – two burner with grill and oven. Force 10 stainless steel barbecue on deck. Adler barbour 12 v cold machine refrigeration, in built-in large capacity well-insulated ice chest. Engine – 35hp 3HM35F Yanmar, approx 1500 hours, with new 80 amp alternator, and two fuel tanks holding 40 gallons fuel in total. Two jerry cans with 10 extra gallons on board. Lots of spares come with this engine including hoses, filters and alternator. Full set of sail covers, bimini and dodger in Pacific Blue Sunbrella. 45 lb CQR, 35lb Max, 25lb Danforth, 200ft of 3/8th chain and 300ft of rode on CQR, 20ft of chain and 200ft of rode on Danforth, solid Plath/Simpson Lawrence bronze Gypsy Windlass. Brand new Air breeze wind generator and four Siemens solar panels giving 180 watts. Parachute Drogue/Sea Anchor, and 600ft of spare rode. Hull is sound – boat was hauled and repainted inside and out last year and there are no problems with structure of boat. Teak and mahogany cap rails have also been refixed and finished to ensure ongoing dependable protection of ferro cement below decks. Decks are resheathed and in very good condition – epoxy over ferro cement. Abandoning the rat race and sailing off into the sunset is the stuff of daydreams for many. But Bill Cooper and his wife Laurel actually did it – and, 36 years later, can say they have lived the dream. Mr Cooper, 83, a former City broker who used to advise Harold Wilson, decided to cast off for good as he made his daily commute to work in 1974. He returned home from the railway station and asked Mrs Cooper to call his office and tell his colleagues he would not be coming in. Ever. Over the next two years, they built a boat before selling their house, bidding farewell to family and friends, and setting sail for a life of adventure. Now, after an odyssey spanning more than three decades and 100,000 miles, berthing in 45 different countries, they have returned to drop anchor back home. Age and ill-health have brought their astonishing journey to an end, although they still plan to remain afloat – on the calmer waters of the River Medway in Rochester, Kent. It is a well-deserved rest for a couple who have crossed seven seas, negotiated 22,000 miles of canals and rivers, and coped with storms bringing 25ft waves and 100mph winds. Mr Cooper, a former Royal Navy officer, became disillusioned with his high-flying career as a gilts broker and government adviser in London. 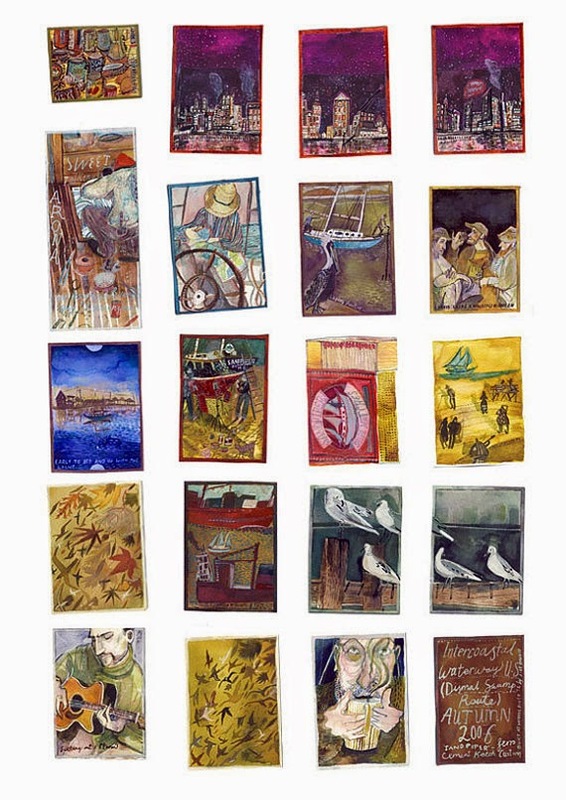 He recalled how, on the day he changed the course of his life, he set off for work and was half- way to the station in Chatham, Kent, when ‘I said to myself, “I’m not going in today – I’m fed up with it” ’. He added: ‘I said to Laurel, “I’m giving up, tell my partners I’m not coming in any more”. ‘I’d been working as an informal adviser to Harold Wilson and there came a point where I decided I couldn’t get on with it. With Mr Cooper in charge of the woodwork and his wife taking care of the painting, the couple built a boat together, and in 1976 sold their detached, six-bedroom house and gave the money to their children Shelley, now 58, and Benedick, 54. Funded by a Navy pension and the proceeds of selling Mr Cooper’s partnership, they set sail on their 50ft steel ketch Fare Well and never looked back. 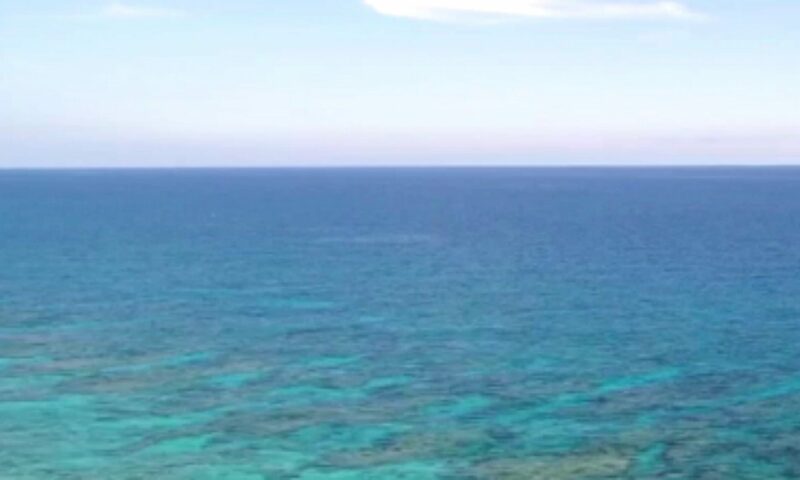 The first ten years were spent sailing the Mediterranean and Caribbean, across the Atlantic and along the American Intracoastal Waterway from New York to Florida. The pair, who once kept a one-eyed cat called Nelson on board, even received a medal for crewing the only vessel to survive the devastating Hurricane Alberto north of Bermuda in 1982 without calling a lifeboat for help. In 1986, they bought a new vessel, an 87ft former industrial barge which they named Hosanna. They then spent the next two decades cruising around canals in France, Belgium and the Netherlands, and sailing the Aegean. The couple, who have three grandchildren, returned numerous times over the years for Christmases and other family occasions. 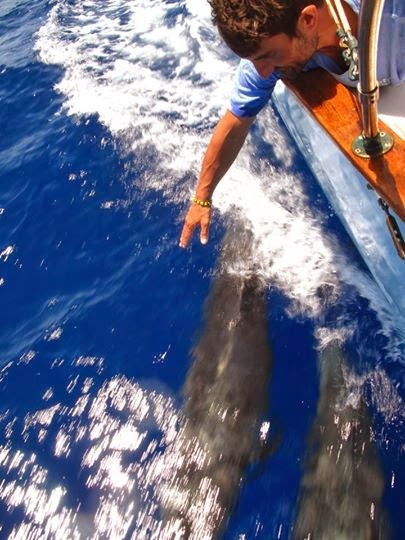 In 2005, they took on their third and final boat, the 40ft Faraway, which will continue to be their home. But on its maiden sea voyage to North Africa in 2007, Mr Cooper began suffering eye problems and was forced to stop in France. After several years of travelling back and forth to England for treatment for macular degeneration, he has now decided it’s time to moor up for good. He said: ‘We’ve had a wonderful time but I’m afraid I have been overtaken by ill-health. ‘When I got to about 78, I thought, “This isn’t going to go on forever”, so we built a boat we could manage when old age really strikes. We call it the geriatric boat. He added: ‘I really think we have had the best of it. ‘We’ve had modern materials to build the boats, but we did most of our sailing before health and safety really started up. ‘Now I’m not walking as well as I used to when I was young, so we’ve had to come back to England. Mrs Cooper, 82, said: ‘I’m like a cat, I can be comfortable anywhere – it’s how I have survived all this time. ‘Bill’s a brilliant sailor. He was very much the captain and I was the mate – he would always steer and I dropped the anchor. ‘We have had an absolutely amazing life. I wouldn’t have missed it for the world. ‘I’m very happy looking back at all the wonderful places we’ve been, the people we’ve met and the adventures we’ve had. After sailing 100,000 nautical miles in boats they made themselves, Bill and Laurel have travelled to varied and unusual locations around the globe, taking in sights that many of us can only dream of. Beware of what you wish for; you are apt to get it. If you think you want an adventure, try this. I dare you.